Is LottoSend a Scam or Legit? Read 27 Reviews! Deposit: Visa, MasterCard, Maestro, Diners Club, JCB, Skrill, Neteller, Instant Bank Transfer, Bank Transfer, etc. LottoSend Exposed — Send Me to LottoSend! LottoSend is an online lotto agent, having several offices around the world. The main sales and customer support office is based in Slovakia. LottoSend address is Exchange Plus Investment & Consulting Inc., 34 Calle 42, Panama. LottoSend could be reached by the phone numbers +44 203 695 1068 (UK), +1 201 500 6359 (US), +7 495 004 0889 (RU); live chat, contact form and email address [email protected] Lottosend.com operates since 2013. It offers 10 world lotteries and 10 group plays. The service is available in 10 languages. LottoSend caught our attention again after noticing they made a major facelift to their website and customer touch. Just to recap Lottosend is an online lottery ticket service that offers a way for players everywhere in the world to purchase tickets to several of the largest lotteries available. LottoSend.com provides players with the opportunity to get lottery tickets for ten lotteries. Admittedly, they are ten of the biggest jackpots internationally. US Powerball, Mega Millions, EuroJackpot, EuroMillions, SuperLotto Plus, El Gordo de la Primitiva, Euromiliony (Slovakia), Oz Lotto, Oz Powerball, SuperEnalotto’s jackpots have gotten up into that gazillion realm of winning mega bucks. Please note that LottoSend is an official reseller of the Australian lotteries. Unlike most others, LottoSend actually delivers on their promise of a scanned ticket in your account for every draw. So you know you are entering for your chosen lottery game, even if you can’t go to the lottery stand yourself. That said, there were occasions when I had to contact the support because I did not see the ticket immediately, and they replied that tickets are scanned in a batch just before the draw, which proved to be correct. Moreover, LottoSend provides the access to 10 group plays, including the winning guarantee, which guarantees a minimum winning amount for the American lotteries. LottoSend.com does say that they take no fees or any percentage of your winnings. Jackpot tickets should be claimed in person. All other winnings are transferred direct to your account. The only way to withdraw from your account is by bank transfer and they don’t specify if there is a minimum account. The only way to find out is to register, go into ‘My Account’ and click on withdraw. What distinguishes LottoSend though, has to be the support department who has been available not just for emails for a change, but also in a live chat and on an actual phone. Although from their contact page it is clear that they don’t operate 24/7 but when they are operational they were quite efficient in answering my sometimes annoying questions without making me feel unwelcome. We were impressed with the new additions in which they cater customers from different countries and providing more over 50 different payment types, most of them local payment options, so pretty much no matter where you live, you are likely to find a convenient and familiar payment option to purchase on their website. Also, I think that adds to the credibility of their business as not just anyone is approved to use such services. When it comes to online lottery websites one of my biggest concerns is the security of playing online. This has not been an issue with Lottosend as their website is protected by COMODO Security and 128 SSL bit security on all pages. This is especially important since all my winnings are credited directly to my account. Their website is simple enough to use and have all the essentials for a professional lottery website. They have six different languages available and according to their FAQ, it seems they are working on adding more. Their FAQ page is pretty comprehensive and includes answers to questions on how to play to where to find lottery results. They also offer a little history of the lottery games which I thought was a nice addition. LottoSend offers a first purchase Welcome Bonus 100% up to $30 with no restrictions, the player can purchase any ticket he wants. Also, LottoSend has a big multi draw discounts up to %20 in addition to the Welcome Bonus. If you like the Spanish raffles, they also have discounts for them. Besides that, we have a good news for the Lotto Exposed visitors, LottoSend offers an additional 20% discount for all of you. This discount applies to all the lottery games. Add bonus code “EXPOSED” on ticket purchase and the discount amount will be deducted. 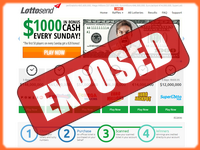 Overall LottoSend looks like a reliable and trustworthy lottery service. I really appreciate seeing my actual lottery ticket in my account as well as seeing my prize money credited as soon as the lottery results were posted. ONLY FOR LOTTOEXPOSED VISITORS: Apply the following promotional code EXPOSED to get an additional 20% off on buying any lottery tickets! We are pleasant to see that LottoSend is growing and moving forward. After a few revisions we have done, LottoSend gets a thumbs up. Keep up the good work! Good service, bought tickets for the Mega Millions draw, tickets scanned! I just bought a few tickets for the $1 Billion Mega Millions on Lottosend, I hope I will win! Lottosend IS A SCAM! Even if you win, you can’t withdraw the money. Do not buy tickets here! These people are scammers! They are ACTUALLY A SCAM!! All reviews are left by scammers or employees. Firstly, the website isn’t easy (which is weird that everyone comments about it). But secondly! They don’t upload ‘real lotto tickets’ as everyone claims. They’re fake and computer generated! It is very obvious because every ticket is the same. Not long after depositing money they call you and give you an ‘account manager’. It’s the dodgiest call ever! If you look hard on the net you’ll actually find these calls ask you to deposit thousands with the guarantee of winning big… want to know the funny bit? In the terms and conditions – they expect you to catch an international flight to pick up your actual lotto ticket! Great that you’d pay that as well to pick up a fake computer generated ticket! On top of that. Deposit all you like, but the account has NO WITHDRAW OPTION! All negative reviews are real! The positive reviews ARE FAKES! I’m lucky to only be out $15! Don’t fall for this scam! I’ve blocked and ordered a new card! Jokes on you scammers! I suggest anyone who deposits money do the same! We would like to know why you think we do not upload real tickets. Our agents purchase the tickets and scan them according to the players’ chosen numbers. We do not guarantee any winnings and we can not guarantee any winnings in general, since this is a lottery. Furthermore, we do have a service of collecting secondary prizes when our players win. Our system automatically transfers the funds into the players’ accounts on our website upon publishing the results and we do allow to withdraw funds from the site and players withdraw their winnings every day. We are really interested in understanding why you would not agree with all of the above. Site simple to explore and incredible for placing a last moment line when you can’t make it to the shops any longer. Adding cash to your record is simple too once you have set up your installment points of interest. Generaly Lottosend is great site, but i would like to mention their support service. Great service, and realy great people. A+ from me. Has everything you’d want from a lotto site, looks great, works great, and the staff is nothing but friendly and helpful. I’m really exited when i received ticket. Its make me really happy because i just waited for this chance. Got great live and message support. Really Lottosend is very good work for me. The whole system is amazing and they are always on time with the ticket scan and support chat which is great. I am very happy with lottosend. Lottosend is very awesome to me. It does always give me very nice service. I purchase tickets from home, got scan and that’s it. Its process is very comfortable to me from other website services. I had really great experience using it. I do not recommend, I’m still awaiting their response, nobody there has time for third customers only when they want money, they will make you happy like a hell, and thereafter all gone. I just joined lotto send on the recommendation of this page and l find them quite expensive for one. I would also agree about customer service. I sent 2 enquires a few days ago and never received a response, but l did receive calls from my “Account Manger” aka someone trained to get more money out of you. Who knew nothing about my account enquires and just liked the sound of his own voice. Who ended up “accidently” disconnecting the call when he realised l was not happy and never called back. My enquiry related to their main promotion of depositing money and receiving 100% back on the first deposit. I tried this but when l went to use the money it said l could only use it for raffles and group games (both of which l never play). The raffle is in 30 days and costs about $40 and l sont play group games because when I win the jackpot l don’t want to share it like most people. It seems these days its hard to find international online lottery companies that are honest and transparent. I prefer local companies because they are regulated and know they can’t “trick” people without consequences. I don’t recommend them at all. If they can be dishonest once they can be again, but l don’t know a single company who offers international lotteries who don’t have bad customer service and are honest but also offer reasonable priced tickets for those of us who are not lottery addicts willing to pay $40 a game. Does anyone know one? But l would say no to this, bad service, money grabbing and dishonest marketing practices. And they also advertise 100% money back guarantee. But I have asked for a refund from my first play and it’s been days and no response. They either need a new marketing manager who is honest or need to fulfill their promise. Nothing in their terms and conditions says that the cash back on deposits is limited to certain games. So they seem to be tricking people and l don’t like it. I’m tempted to believe some of these reviews are fake because there is no live support! What are people talking about. Some of the reviews are from the same month as mine. I have waited 2 days and have yet to receive any response from them, just one call from a man wanting to sell me more tickets, (Account Manager) who hung up on me and never called back. I hope these people leaving feedback are real because what they say is not true “live chat and help”. No, there is none. I was looking for a place to buy some USA Powerball tickets and I came across this website on my mobile, and found out this is a really simple site to purchase lotto tickets for both American and Europeans draws. I tried it out and found it deliver as promised. I came across this website as I was looking for an easy way to purchase some EuroMillions tickets and found this website really simple and fun to use. Nice review as always Nick – You do a great service. I tried LottoSend and they were great with me. Even got some complimentary tickets a few weeks ago after I had submitted too late for the Powerball without realizing – really friendly and unexpected. All the offers out there are quite similar when it comes down to it, but you can’t put a price on a good service. Since then I have set up a subscription, and I am not looking back. I just started using them recently & so far so good. Been impressed with their support team also, I’ve been playing online for a couple years now and I’ve been pleasantly surprised. I’m thankful to Lottosend! It’s great service, which provides cool options. I had great experience using it. Everything is quickly and simply. I bought tickets from home, got scan and that’s it. Very comfortable. Certainly, I will come back! I actually didn’t have any problem purchasing Powerball tickets from this agent. The scanned tickets were sent to me next day. They have notified me by mail. So basically I would recommend people to buy tickets from them, if they can’t do it in the shop. Hi everyone! I want to share my experience with all of you. I was satisfied with Lottosend. It is convenient in use. I didn’t have problems with it, I got my scanned tickets in several hours after payment. Before making purchase I contacted with support agent, who answered all my questions. As for me, there is nothing to wonder about price advance. You don’t have to stand in queue, you have possibility to buy tickets from everywhere. I think that some extra options cost extra money. All in all, I’m pleased with this service and I can recommend everyone to use it! Bought some Powerball tickets to the nearest draw. Won roughly $12, but my tickets were never uploaded and I never received my winnings. Emailed support and they said the tickets wouldn’t be uploaded to my account. Even though a there are a million spots on their website that say that they make every effort to upload your original tickets once your “agent” goes out and purchases them, usually no more than 24 hours after the game is over with. Obviously my assigned “agent” never purchased them and they don’t keep their promises in any way. I’ve found out the hard way that this place is a total scam. There are several different kinds of games available on the site. Single type tickets, where the customer purchases their own individual tickets are uploaded as scans soon after the draw, group games, however, are not scanned at all but rather shown on the site depicting the numbers that were entered. We would very much like to assist you in solving the issue that you have presented us with and encourage you to contact [email protected] with more information about your problem so that we can resolve it without further delay. During the last Powerball draw’ I purchased my tickets 2 days ahead. I didn’t get my scan until 8 hours after the draw. Tried calling and emailing several hours before the draw but no answer. Funny they were able to process the credit card but were not able to provide my scan. I’m willing to bet they would have said they didn’t have time to purchase the ticket if it was the winner. We would like to check and correct all customer complaints to our clientele satisfaction. If you are registered with Lottosend.com, please send [email protected] an email with your email address and as much information as you can about the “missing” tickets and we will resolve this issue asap. Looking forward to hearing from you. I made a tapping mistake in my email address and know I can’t change it … Plus, it takes too long to process the payment and getting the ticket. There is no problem for us to change your email. Please contact [email protected] with as many identifying details you can (first name, last name, phone etc..) and your desired email. If you have created an account with us, we will alter the email and send you instructions to create your own password. Lottosend selling $22 (20 Euro) decimo ticket for $37. I bought a one share of Spanish Navidad ticket number: 45010 for $37, the ticket won 200 Euro as the last digit of my ticket matches with the last digit of first prize. Ideally, I should get 20 Euro per share (200 Euro /10 shares), but I have been paid only 2 Euros by Lottosend. Either the price amount is credited wrongly as 2 Euros or they are selling a single 20 Euro ticket to 10 people and charging each one $37 and earning totally $370. This is absolutely cheating in the name of group purchase. People will think that they bought a 20 Euro ticket but actually their ticket worth only 2 Euro value for the amount actually paid for $37. We have not been able to locate an account with the information you provided that matches your case. If you feel that you have registered with lottosend.com please send additional information to: [email protected] so that we can locate your account and assist you further. Please send us your email OR phone and full name. Regardless, we welcome you to join Lottosend.com, we do not steal money. Ever. I funded $15 with Lottosend or Lotto Millionaire using a bank credit card. The $15 never showed up. I emailed them earlier today and not have heard back from them. I recommend lottosend.com for all true players! Becouse I used this website many times and its was always fast and I can choose a Payment method wherever I wont! They have many amazing offers and sale’s and its always been easy to claim my winnings. Also, its wery important, the email support has always been very speedy! Good luck for everybody! Dear Sir, i want to know why you pepole cheat and dump me for 80000inr this is against cheating and fraud to indian citizen please check the corrospondance in my mail id [email protected]. Otherwise, I will suit case in british council for cheating case by lotto send to indian citizen. Whenever a client of ours complains, we take it very seriously, which is why we went back to check whether a mistake had indeed been done, costing you 80,000 INR. We found 2 transactions from May 19th 2015, one for $12.5 and the other for $72.5. Both transaction failed to process and no money was ever taken from you. We checked again with our bank, and confirmed again, no money was charged as both transactions failed to process. However, if you know otherwise, we would like to address this matter without delay, please contact our support staff at [email protected] and they will explain what to do from there on, we promise you that if you are right, we will credit your account immediately. We would be more than happy to see you again and offer you alternative methods of payment that will better suit your needs perhaps. For your convenience, we have sent you an email with password recovery instructions in case you forgot it by now, also, for your convenience, at the bottom of the email you will see all of the ways to communicate with our support staff, who work diligently to make your experiences with Lottosend.com as pleasurable as possible. Thanks for the question. Lottosend.com allows all customers to participate in all the available lotteries on the site, regardless of their nationalities, gender, religion and belief, providing that they are of legal age. We advise our customers to check that they have all the proper travelling documents (Passport & Visa for example) in case they need to fly and claim their prize from the country in which the lottery is played. I used to buy tickets through ozlotto.com.au while I worked in Australia but after returning to India, I wasn’t able to buy any tickets using my international credit card, issued in India. We have several offices around the world, including in the US, Spain, Italy, Austria and HQ in Slovakia where the company is based. Hey, i am regular purchaser of this online lottery, i just want to ask if get luck to won the jackpot prize how can i get the money… I am non US citizen and no US visa…just asking…. Hi Richie! In the case that all of you are the lucky winner of the jackpot prize you will be immediately notified of your good fortune by Lottosend’s customer service team to coordinate ticket collection from our local office manager. Once you have the ticket, you will need to personally collect the prize from the official lottery organization. Since we pride ourselves in our ticket messenger service, we advise that you seek legal and financial advice prior to prize collection as we do not provide visa or legal services although we will happily help you fill out your claim forms if needed. Hi David.. Now that you have started offering group games, can you please explain the process of prize collection if the group wins the Jackpot… That would be very useful and provide confidence to purchase the group tickets that you offer. Hi Pavel! First and foremost, please don’t settle for written reviews on auxiliary sites, read our website itself and you’ll notice that our offices reside in Slovakia, not Panama. In regards to our security measures, we have several safety procedures in place to ensure that your ticket is safe and only redeemable for the jackpot by you. 1. All our agents go through a rigorous hiring process, we only hire the most responsible individuals. 2. Once they are a hired local agent, they sign a legal binding agreement with a lawyer, outlining all lottery tickets purchased and redeemed by them are on behalf of Lottosend and not for their own personal benefit. 3. Once the ticket is scanned, the agent no longer has access to the ticket. It is counted and stored in a safe only accessible by a third party lawyer. So in the case that you’re the lucky winner, you are immediately contacted by Lottosend’s customer service team to coordinate ticket collection from our local office manager. Once you have the ticket, you will need to personally collect the prize from the official lottery organization. At Lottosend, we take pride in the integrity of the service we provide so that we can guarantee our customers a safe and responsible service to play lottery games worldwide. Including on our website, personal data confidential is a top priority for us, which is why we use multiple layers of security, while encrypting sensitive pages containing personal/financial data with 256 SSL bit security. In short Pavel, no need to worry about not receiving your jackpot winning ticket! If ever I win the jackpot and am from the Philippines, does it require me to travel for me to collect the winnings or is there any other option? Who would arrange for my visa going to the country where the draw was held or where the winnings will be collected? Thanks for your question, we get this one a lot! Official lottery rules do require that the jackpot winner claims their prize in person. For this reason, there is no alternative to collecting your jackpot in the country where the official lottery organization is located. It will be your responsibility to arrange any visas necessary. For this reason, we advise that you seek legal and financial advice prior to your jackpot prize collection. We advise that questions regarding our services will be asked and directed to the proper channel of support and not over unrelated blogs so that we can insure a proper and timely answer to any matter, pressing or informative. If you have any other questions, we would appreciate you writing us at [email protected] or through our website. Do you email the winning number and notify the customer if you win a big amount? What is the procedure? Does customer have to collect in person or there is another option? We notify our customers of any prizes won by email as soon as the official results have been verified. If you win a small prize, your account will be credited with your winnings as soon as the results are made public. If you’re lucky to win a large prize amount, including the jackpot prize, you will be contacted by our customer support team to coordinate collecting your ticket from our local office with which you need to personally collect the prize from the official lottery organization. However, hope that clarifies any questions you may have, feel free to contact us for further information at [email protected] or visit the FAQ section on Lottosend.com. I had my credit card debit for a ticket purchased, receive a confirmation that some ticket agent was standing in line to purchase my ticket. Since then no word from these people. I also received an email telling me to look to somewhere in my account where I would find a little box giving me information on my purchased ticket. There is nothing like that in my account page. Is this a scam or what? Dear Glynn, I have personally checked this issue with our support team and I can confirm both Michelle and Robert from our team were in touch with you in the last 72 hours (including your replies BTW…) so writing you have not heard a word from us is not accurate. A copy of your ticket is located in your account, under “my lottery tickets”, but in case you had a little trouble getting there I’ve asked our support team to extract the copy of the ticket and email it over, so it should have hit your inbox by now. I hope your future experience with us would be enjoyable and we always welcome feedback in order to improve our website and service. I’ll be sure to update on new features we add as soon as we add them. We will check out this website often to respond to any need or request. Thank you very much for allowing proper conversation and an ability to retort. Thank you for reviewing our website so early on, we will learn from it as we always do and fix the issues that we feel were brought up justly to make sure our customer’s satisfaction. Lottosend.com has been an active site for the past 3 months only, and our learning curve is far from over, we appreciate you took your time to review our website in its very beginning and invite you to do that again in the future after we have worked for a while longer and adjusted to our customer’s needs and feedback. However, we would also like to correct a few errors that were reported here as well as shed some light on the procedures regarding which questions were raised. The name Lottosend.com was indeed selected because of the service we offer to ship Lottery receipts to clients who choose that option. As the name suggests, it contains 2 words that we felt need no further explanation, Lotto and SEND, maybe unimaginative, but simple enough to understand what we do. The option to ship one’s ticket lies entirely on their decision. Because snail mail gets lost sometimes, we take the precaution to only use courier services and tracking numbers should that be your selection. Snail mail was added after we made extensive market survey and learnt that many clients are leery and suspicious towards having “No Proof” that their purchase was ever fulfilled. The vast majority of our clients are content with the normal service which entails a copy of their Lottery ticket receipt that is uploaded to their personal account, prior to the draw, scanned in High Definition and Color for their enjoyment. The 5 lotteries we offer are truly among the most profitable ones, but we are glad to say that this is just the modest beginning. We are constantly working on expanding our lottery portfolio, and will add more lotteries as time passes. Jackpot tickets require the client to physically be in the country where the draw took place, Lottosend.com does not represent itself as the client, nor does it reserve any other right to charge the client again after submitting their tickets. Small prizes are credited directly to the personal account, and can be withdrawn in one of 2 ways – bank transfer or Credit Card. In both cases, the client’s bank dictates the amount that will be charged in the process for allowing the transfer to realize. The taxes that apply will be clearer and stated in the information page and not in the FAQ as they were. To get in touch with our customer support, all you need to do is send an email to [email protected] or click the “Live Chat” button that is visible on the right side of your screen every time you are on the website. We invite you to visit us again in the future when many more features will be available or to enjoy the services that are provided, securely, efficiently and enjoyably. I had my deposit fund deducted in the recent US Powerball lottery. I did not receive any scanned ticket as promised in my email. I could login with my email, but they said my email was not registered. I wanted to cancel my account but there is no options in the site to cancel your account. Not happy with lottosend. I want my money back. From what you described, it sounds to me that either your account was canceled, presumably because you requested it to be canceled by email or phone. Regarding the scanned tickets, those are not sent in an email but are available in your account on the site. If you would like to see them again, we will need to reactivate your account. Please forward such a request to [email protected] and we will gladly comply. Something with Powerball and Mega Millions you guys claim that you don’t charge fees, but you sell each share for $9 for Mega Millions and it’s like 56 shares at $9 each which means close to almost $550 total for 56 shares and each Mega Millions number only cost $1 each not $5 or $9 so how is it that you’re not charging fees? I think you guys need to change your business practices and it’s unethical. Our model is based on the ability to offer customers from all over the world exclusive raffle tickets which are based in Spain, and we’ve purchased & secured a batch of tickets in advance to accommodate the needs of our customers. This was our first time offering the Xmas Navidad raffle and our price is on par with our competition and with our latest promotions considered attractive. With regards to your claim, it will be checked and if there was indeed a mistake with your winning amount, you will be compensated. I wish you the best of luck and happy New Year! A Fraction of Raffle ticket such Navidad or El Nino is 20 Euros and i found in Lottosend website that 10 shares are available for that Fraction and each share is prized at $ 37 that means 20 Euro fraction is sold to 10 people for a total of $370. The same has been clarified by Jennifer (Customer support executive of Lottosend) that Lottosend is selling a 20 Euro ticket for $370. Her reply is given below “In case that all shares are pruchased for full price than you are correct”.